If you follow this blog, you know I regularly review items from Brenthaven, a great company with an awesome focus on the educational market! Their designs are intended to withstand even the most careless student, with cases that can take being thrown in the locker, to headphones that have a breakaway plug for those students who get tangled up in wires easily. And, although we can try to control how the school's technology is treated while in school, we have little control over the out-of-school safety of the devices, as illustrated below! It is important schools invest in protective and proven device protection of the type Brenthaven offers. "A mess of wires" by Marshall Vandergrift. CC license: CC-BY-SA. 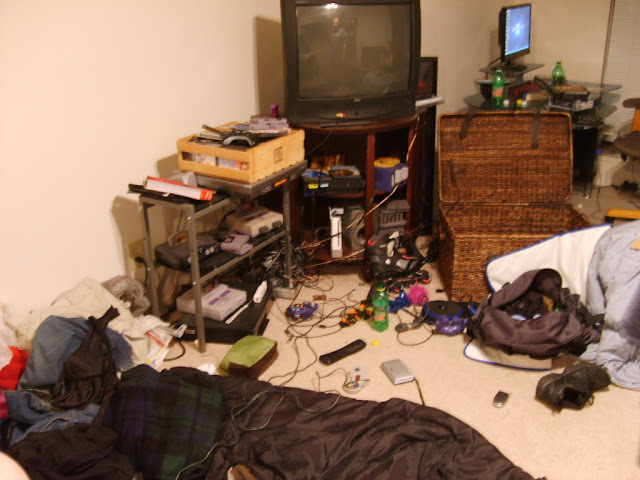 Flickr, 2007. Brenthaven allows me to look through their offerings and pick two or three I personally feel are items that would be great for schools! I view their collections with a different point of view each time. 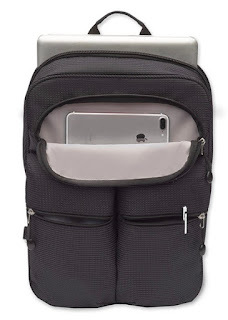 Sometimes, as I did in my previous reviews of the Tred Zip Folio and the Edge Carry Case for the iPad, I am considering ways the student devices can be kept safe when in and out of the backpack. This time, I was interested in reviewing two backpack-- ones that work well for student and teacher smaller devices. Brenthaven's Tred Slim Pack backpack is made especially for the K-12 environment. I chose to review it because of its smaller size. With many schools supporting a 1:1 laptop initiative and providing students with digital copies of textbooks (with sets of paper textbooks being kept in the classroom), there is no need for students to carry the large backpack of a few years ago that weighed in, with books and larger devices, at 20-25 pounds. 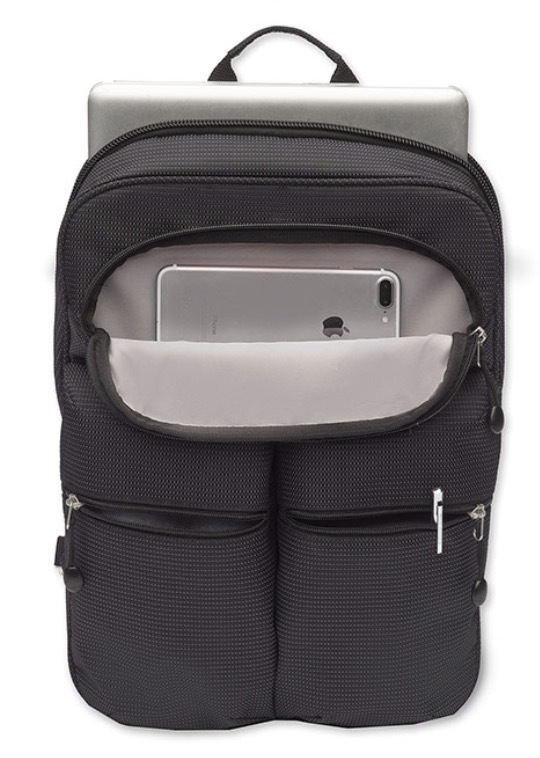 Below is a video I created in 2013 illustrating this transformation of a student backpack because of smaller and more powerful technology tools and apps. 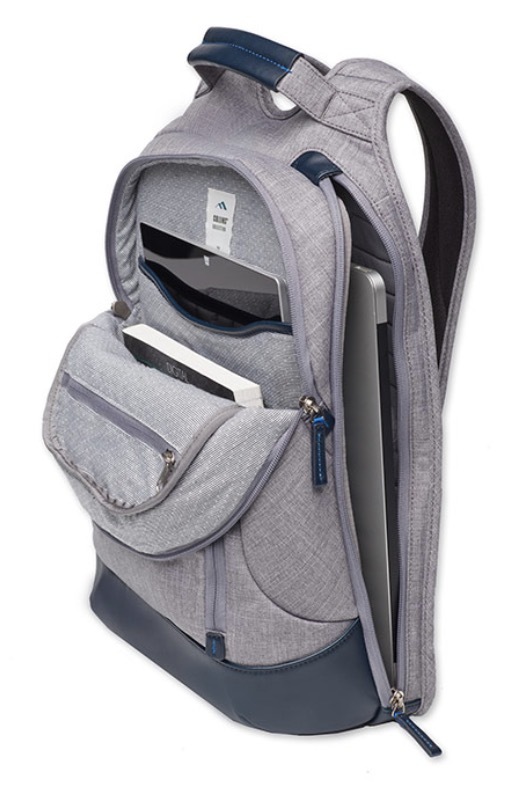 The Tred Slim Pack holds a 14" (or under) laptop or tablet, and the Tred's back zippered pocket is totally padded to keep it protected. The shoulder straps are also nicely padded. In addition, there are two large zippered outside pockets that can be used for cables and power supplies, snacks, or even a water bottle. There is also a full-width horizontal zippered pocket located on the outside for a cell phone, sunglasses, or a wallet. Brenthaven has included some specific features on the backpack to support its educational users. First, there is a reflective item on the front, back, and sides of the Tred Slim Pack to keep students visible and safe as they wait for the early morning bus or walk home in the late afternoons. In addition, the rear of the backpack includes a clear card pocket for easy access to gift students easy access to their ID card. The Tred Slim Pack is very sturdy and protective, but also very lightweight at less than 1.2 pounds. Its external dimensions are 16.5" high, 11.5" wide and 4" deep. I loaded up the Tred Slim Pack with my 13" MacBook Pro, the power adapter and charging cable, my Apple XS Max phone, my headphones, a filled metal coffee travel mug, and a paper notebook. The full backpack weighed only 5.4 pounds! Another nice little feature is the inclusion of a stretchy band to hold the excess from the backpack straps nice and neat. As one who hates those hanging straps, it is a great addition! And, again, it is a safety feature for students who might be riding a bicycle to school or any other activity that may cause loose straps to get caught. The Tred Slim Pack would be a good choice for students in grades 4 -12 due to its smaller size and light weight! Give it a look, and, if you are considering this backpack which will protect the technology and the posture of your students, request a sample unit of Brenthaven's Tred Slim Pack to review! Brenthaven also makes a line of bags and backpacks for educators. I am partial to the Collins series, which comes in graphite or indigo, and I already own the ones starred below. I decided I wanted to review the Collins Backpack. 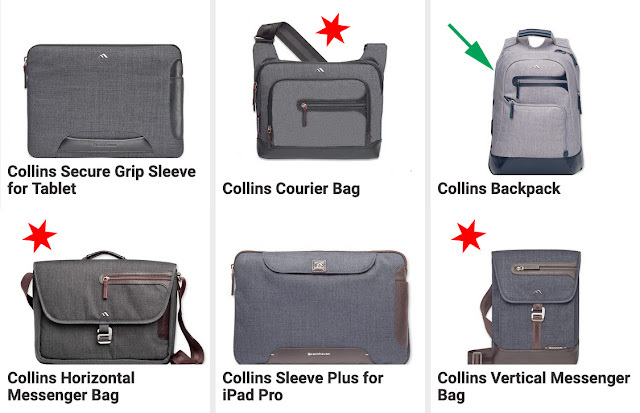 The Collins Backpack is a feature-rich, professional-looking backpack for any educator. It is large enough to replace your "teacher bag" with lots of storage! The side-load, fully padded and quilted laptop pocket can hold up to a 15.6" laptop. (I actually plan to use that area for books, papers , and a light sweater, since my 13" MacBook Pro fits nicely in the middle section padded, quilted pocket (shown on the left with the iPad in it). This second full-size zippered section is an organized teacher's dream! It includes a smaller padded and quilted pocket that can hold a tablet, small laptop, or a sheaf of papers. The front of the padded section includes three pockets for power bricks, cables, and a cell phone. The front flap of this section also includes a half-height zippered pocket to hold additional teacher necessities! This section of the Collins Backpack is very deep and can hold notebooks, papers for grading, and your lunch bag, too! The dimensions of the entire backpack are 16.6" high, 12.5" wide, and 6" deep. It weighs practically nothing -- 1.8 pounds! The front of the backpack includes two zip pockets. The top one could hold a cell phone, small e-reader, or a snack for the teacher's room. The second zippered section unzips on the top and right side and provides access to a key fob, a small padded pocket I would use for glasses or sunglasses, a pencil or stylus pocket, and a small slip pocket for a license, ID card, or credit cards. I love the "vegan leather" bottom on the Collins Backpack since it is easy to sponge off after setting it on a dirty floor. 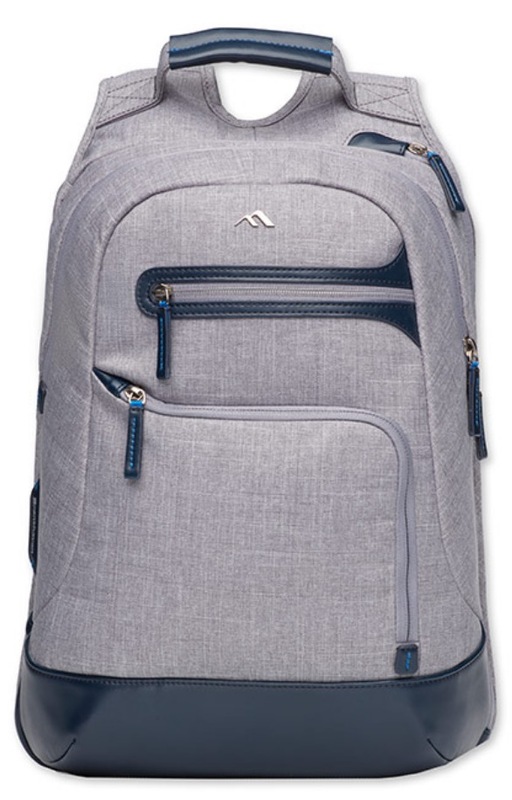 If you load this backpack evenly, the 6" deep bottom will also allow it to stand on its own. 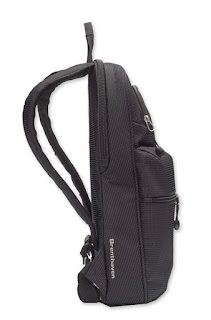 The matching integrated handle on the top of the backpack is substantial and allows you another way to tote the bag. However, the padded back and backpack straps make the Collins Backpack comfortable to wear as a regular backpack, too! If you are looking for a nice backpack to tote back and forth to school, take a look at the Brenthaven Collins Backpack!